Discussion in 'Guitars in General' started by lugnut111, Apr 17, 2016. 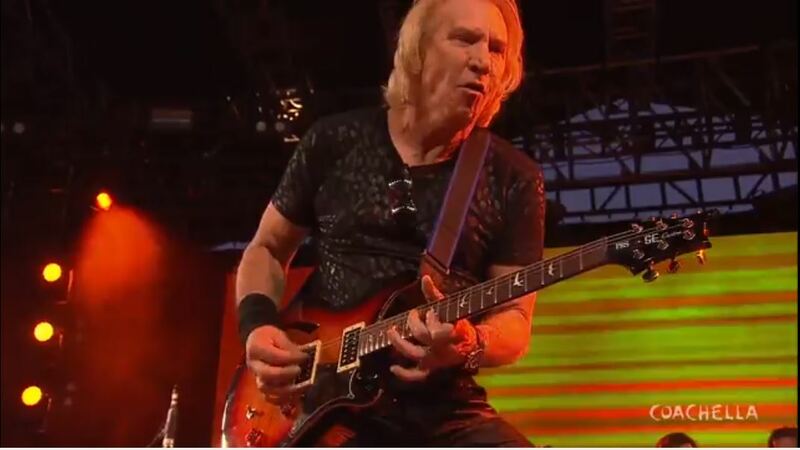 Joe Walsh playing a PRS SE Custom Semi-Hollow. 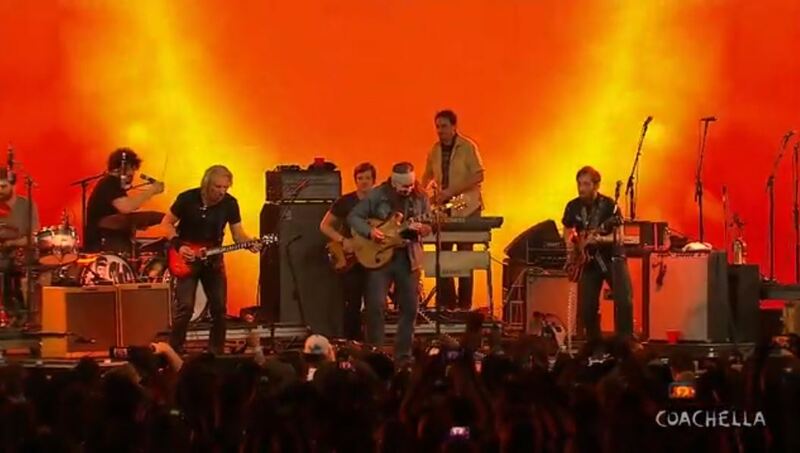 Joe joined Dan Auerbach's band, The Arcs along with Glenn Schwartz onstage at Coachella last night. They played two songs in the set. I bought one of these guitars a few years ago. Musicians Friend had it up as a "Deal of the Day" and I took a chance. When it first arrived, I wasn't sure about the overall look of the guitar. I've never been a fan of flame tops but the guitar appeared well made. The overall aesthetics of the design seemed a bit wonky but, I plugged her in for the real test...tone & playability. It didn't take long to realize it was a keeper. 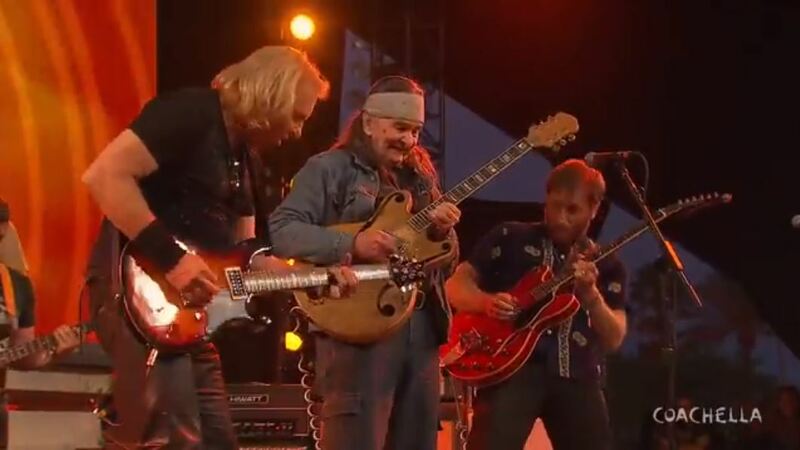 It's always cool when you see someone like Joe Walsh playing a guitar that is not a top of the line or a custom shop model. It looks like the guitar still has the plastic on the pickguard. So, I'm guessing Joe needed a guitar & someone had this one backstage. Either way still pretty cool. Also, does anyone know anything about Glenn Schwartz's guitar? Pointy Headstock and MrLahey like this. I cant' answer your questions about the guitars, but it was interesting to see Glenn Schwartz's name. If I'm not mistaken, he played with a great 60's blues rock band called Pacific Gas and Electric. It's difficult to know what drove Joe to this guitar. It's pretty clear he'll do a Pink Flamingo(you know what I mean) with a guitar for a check but PRS seems unlikely to want to pimp out Joe on the low end stuff. They've got John Mayer on board for 50 limited edition pieces right now at probably close to 10k per guitar retail. How much of a kickback do you give a guy for getting $500,000 in retail sales? Still, I've played some SE's that I really liked and I've always been a big Joe fan so I'm cool with him whipping out an SE for a couple of tunes. I'd be totally comfortable going out and playing one for a few tunes in the local dives I play at. IMO, for something like that, you get lots of design input, probably a couple prototypes, and the 1/50. I don't know how Joe Walsh rolls, but I doubt it was actually his guitar. If he just dropped in to hang out and agreed to do an impromptu guest spot walk-on for 2 songs, I'd bet the guitar belongs to someone else and he's just using it. lugnut111, Whitecat and your name here like this. It wouldn't shock me if some guitar companies provided racks of loaners for high profile festivals like this. Apparently, he bought one or two PRS SEs at Maple Street Guitars here in Atlanta. This was several years ago. They're great guitars, so I wouldn't be surprised if he's playing his own. Really? Can you substantiate that? I wrote the life story of Glenn in my book FORTNEY ROAD: Life, Death and Deception in a Christian Cult. It details his time before the James Gang, with them, and then the three albums he recorded with PG&E. Lots of stories about his interactions with Janis Joplin, Fleetwood Mac, Jeremy Spencer, Led Zep, etc and I put to rest the myth about Jimi Hendrix asking Glenn to play at his birthday party. It never happened. After Glenn left PG&E, he was recruited to the cult in Ohio, the Church of the Risen Christ, and played in their Jesus Music band the All Saved Freak Band. It was one of the most abusive cults of the 60s and 70s. Glenn got out in 1980 and I interviewed him and all the musicians he played with in the book. In December 2015, an article I wrote about Glenn in CLASSIC ROCK ("The White Hendrix") was read by Dan Auerbach and his manger got in touch with me; Dan wanted to record with Glenn--and then Walsh joined the sessions! Then Dan invited both of them to play at Coachella and perform a couple songs they recorded. No release date for the recording yet but Joe tells me "more is planned" and he and Dan had a blast with Glenn. It was SO GREAT to see Glenn performing so well and to such love and acclaim after the hell he went through at Fortney Road. It was very emotional for me to see him walk out in front of that huge crowd since he's only played local bars and such in Cleveland. lugnut111, ef_in_fla and karma1 like this. Dan and Joe were recording with Glenn Schwartz back in February and it went so well, Dan invited them to join him as "surprise guests" so it was planned weeks ago. I'm no guitar expert, but it was all scheduled weeks ago. And it was worth it! lugnut111 and sshan25 like this. Wow - thanks for your informative reply - most interesting! Will check out your book. Fpr me..... Mr Walsh is quirky but intelligent as heck. He takes guitars most wouldnt guve a second look at and makes them sing. He could play a broomstick and i would listen. So many people tend to be shocked that budget level guitars and intermediate level guitars wind up in the hands like Walsh it amuses me. Not that that is the case here by any means just ironic i guess.